The Knight picks up right where The Pawn left off. Avery St. James is trying to solve the mystery of who attacked her father,and who caused the death of her mother. All she has is her anger to fuel this battle and hope that she's trusting the right people. I liked the fact that this book is more about Avery and Gabriel’s growth as a couple; the amount of trust and faith that they exhibit show's that they are being honest with each other. I truly believe that Gabriel will do anything for Avery; he would put himself in danger to keep her safe. He may go about showing this the wrong way but he does love her. Some of the characters from The Pawn make an appearance again, Harper and Justin, only this time they have a more significant role. Avery’s mother Helen moves to the forefront of this story as well. There are a few new characters that hopefully have the potential for their own book down the road. You are trusting your gut just as much as Avery in the this book. You never really know who you can trust. True colors are revealed on a few characters, while others melt your heart! 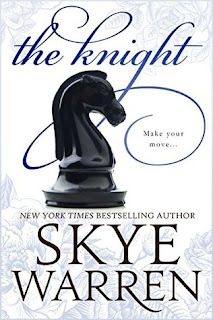 The Knight ends on a bit of a cliffhanger, nothing major just enough to keep you wanting more. This truly is a game of chess in written form. Skye moves us forwards, backwards and diagonally only to come up with a checkmate. I did enjoy this book but I just wasn't blown away. I will continue with the series to see what happens.